Designed to match Apple Macbook and All notebooks. 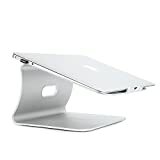 The Laptop stand is made from a single solid piece of aluminum with sand-blasted silver anodized finish.The open platform improves airflow to your device to help a heat sink. It elevates your laptop to provide an optimal viewing angle while also leaving desk space for accessories such as a keyboard and external hard drive.The rear ring of stand makes your cables easily pass through and gathered behind the dock with clutter-free. Provide you with a clean and neat desktop. Durable Solid & Magnesium-aluminium Alloy Material Durable aluminum body weighs only 165g, but can bear a load of up to 4KG. Ergonomic design&Perfect Angle The ergonomic perect angle design,ensuring you have a comfortable viewing position. Spinido tablet stand provide your iPad or other tablets a firm stand position, easy to operate in daily life.Such as Ideal for watching movies, reading, video recording, or simply browsing the web. Spinido products have high quality, that’s why we support them all with a hassle-free One year warranty and friend customer service. Windows Devices and others: Microsoft surface Pro 3 2 mini, Nokia Lumia 1520 1320 1020 930, GPS etc.